Want to be a part of a world-class Musical Theatre weekly training academy being trained by WEST END PROFESSIONALS? We are searching for the BEST young Musical Theatre performers (10-25 years-old) to take part in our 10-week course leading to live performances with West End Stars in London theatres to an audience of agents, casting directors and other industry pros! We have two FULL scholarships available worth £1,380 each! The full scholarship will entitle you to take our 10-week course for FREE across an entire YEAR (3 terms) and be part of our performance opportunities throughout the term. We also have two half-scholarships per term worth £230 to give you access to the course for half price. The 10-week course involves training in Musical Theatre so you would be required to attend/rehearse on Sundays during term time for 3 hours between either 11am-2pm or 2.30-5.30pm. 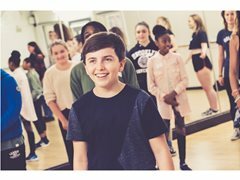 You will be taught by West End professionals and also have the opportunity to work with West End Stars at different times throughout the term. The 2-hour audition will require you to sing and dance but you will not be expected to be brilliant at both. The purpose of the audition is to discover your true potential and NOT to criticise, embarrass or upset you! We are KIND, POLITE and EXCITED to meet you! We are looking for polite and talented performers. If this is you, please apply! Rehearsals on Sundays between 28th APRIL and 7th July. Also Saturday 6th July. Singers who love musical theatre and who are interested in becoming a Musical Theatre Star. We’re looking for dancers who have a voice. You don’t have to be excellent, that’s our job to train you up! We’re searching for actors who have a voice. You don’t have to be perfect. It’s all about your potential to be a lead in musical theatre shows!